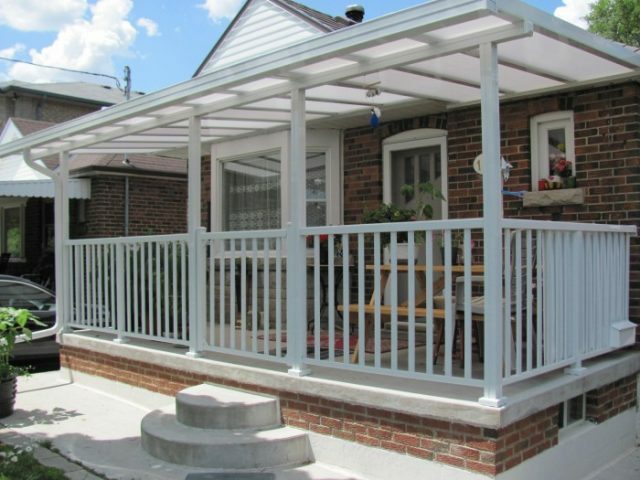 All framing is made from strong maintenance free aluminum. 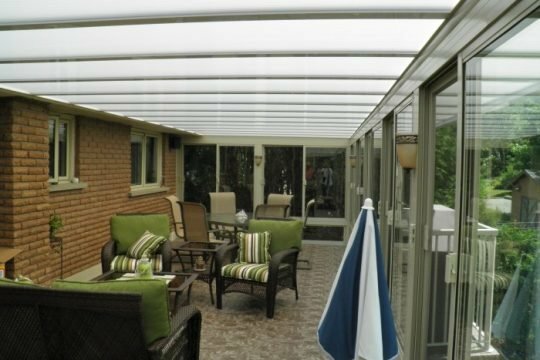 Our proprietary design, the large glazing beams used in Skyview are thoroughly tested… your assurance that your new polycarbonate roof will hold the snow. 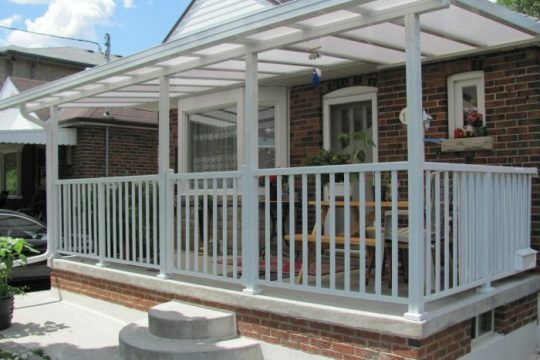 It’s a sound investment that adds value to your home. 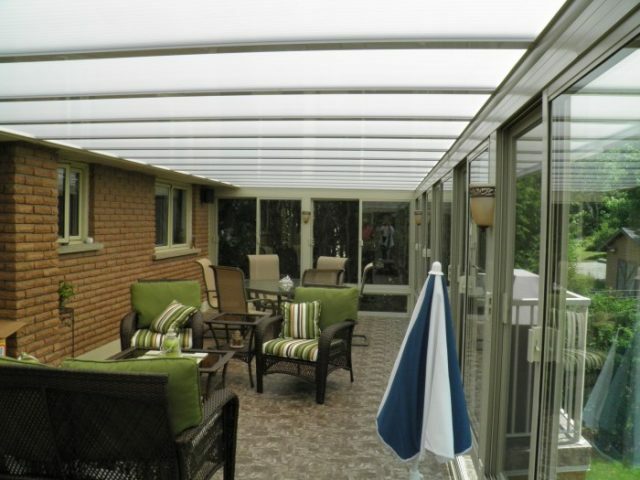 The Northlander™ Skyview polycarbonate roof utilizes strong, multi-walled polycarbonate panels. 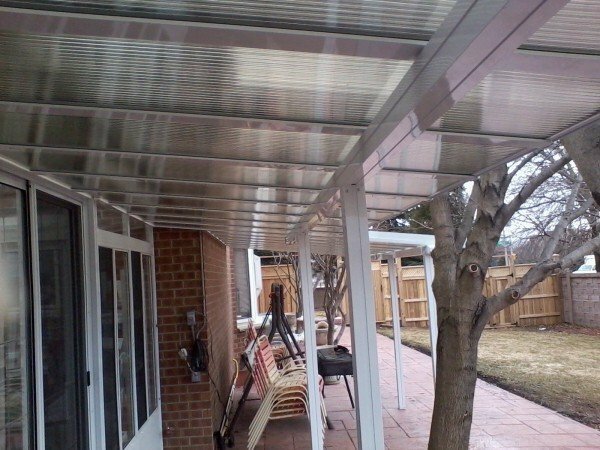 These panels have a range of solar tints that block damaging UV rays while allowing various levels of light transmission onto your deck or into your room enclosure. 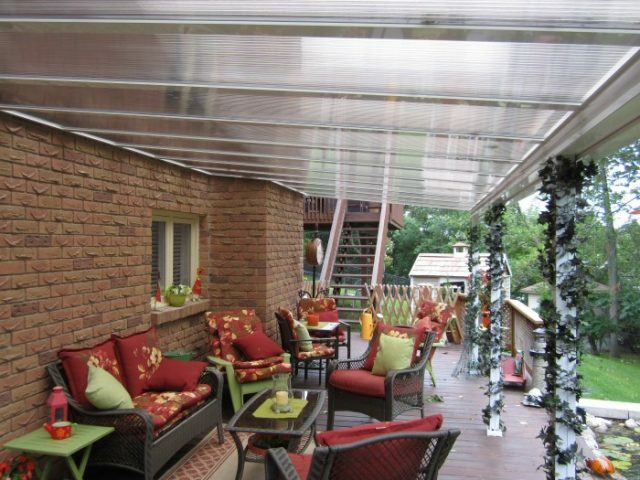 Our exclusive 1¼ inch thick Opal Ice sheet provides a low solar heat gain while allowing a pleasing amount of light to enter your patio room. 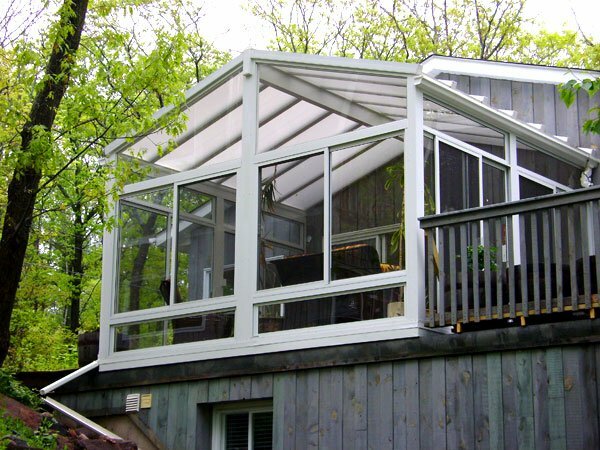 Opal Ice 1¼ inch thick sheets are thicker than our standard 5/8″ thick sheets, and they have many internal walls to trap air thus providing the extra insulation value you want for the roof of your sunroom. 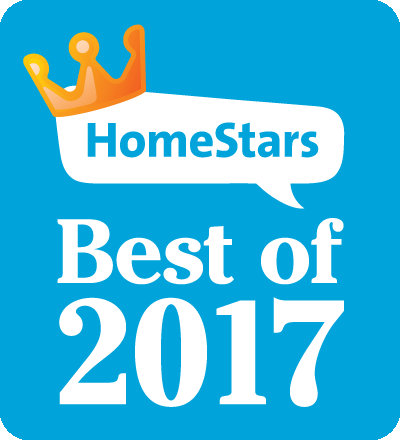 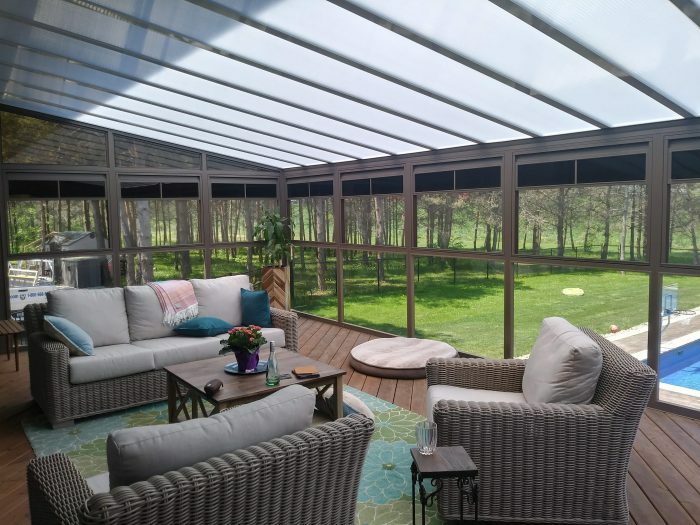 If you are looking for a product that creates the ultimate sunroom atmosphere, turns your patio into an oasis, gives a sense of openness and takes advantage of nature while protecting you from the elements…. 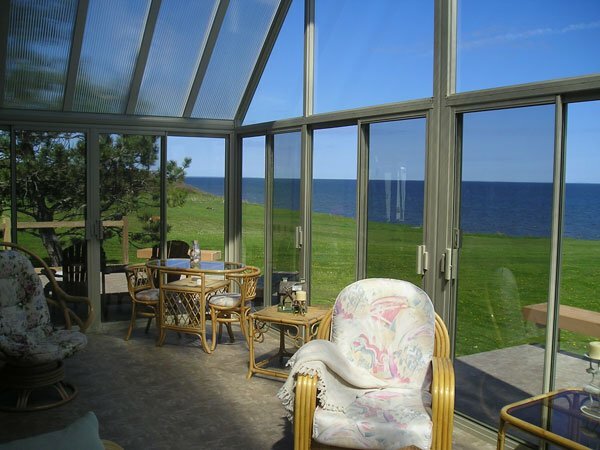 then choose The Northlander™ Skyview. 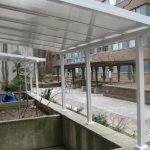 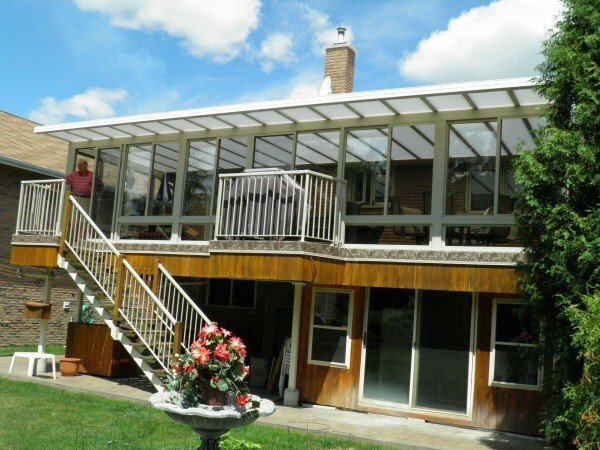 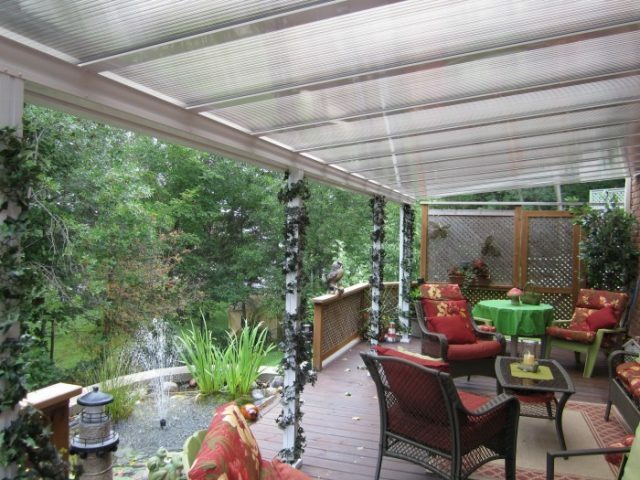 Patio Cover: Excellent protection from rain, snow and UV rays while allowing filtered light. 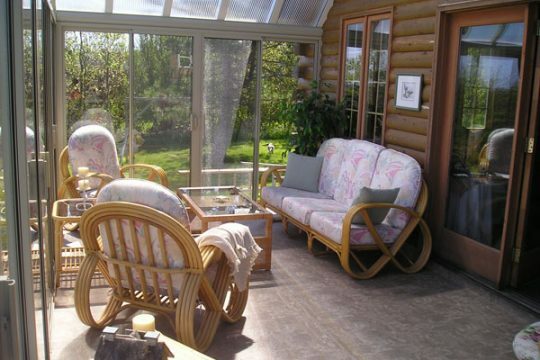 Sunroom or and Screen Room: Prevent hot solarium syndrome, use our sheets to reduce solar heat gain. 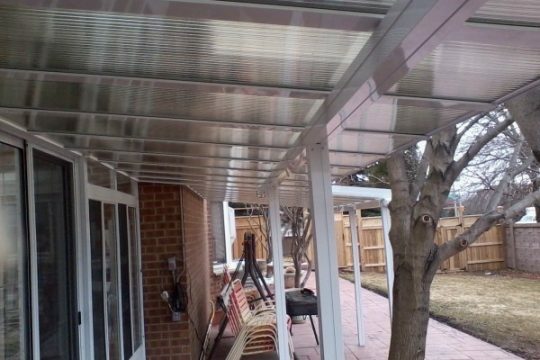 Carport: An opaque or clear cover will provide shelter for your car, keep the path to your door free of snow and let light into your kitchen window. 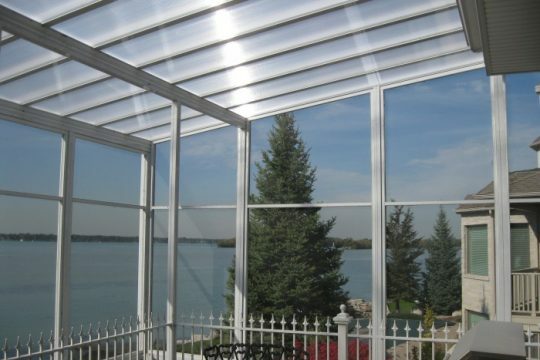 Pool enclosure: The strong Skyview aluminum beams will span your swimming or lap pool. 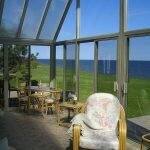 Solarium or Conservatory: Choose our Opal Ice 1¼” thick multi-wall polycarbonate panel for its solar heat gain properties combined with high insulation value. 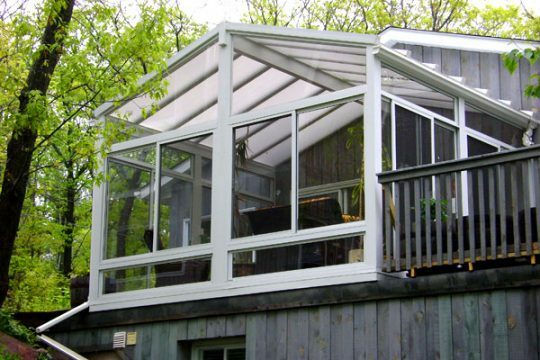 Greenhouse: Use clear panels for maximum lighting to help grow your plants. 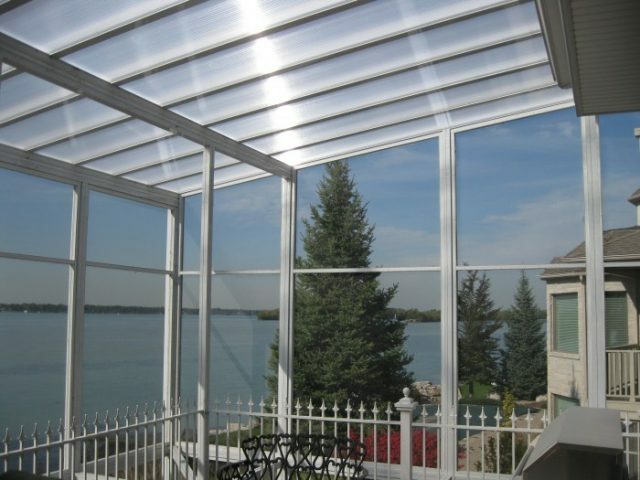 What Are The Features and Options of Skyview Polycarbonate Glazing? 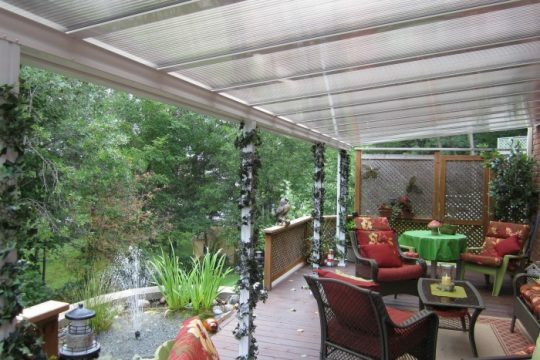 Our unique 1¼” thick sheet with multi layer construction provides the most insulation available. 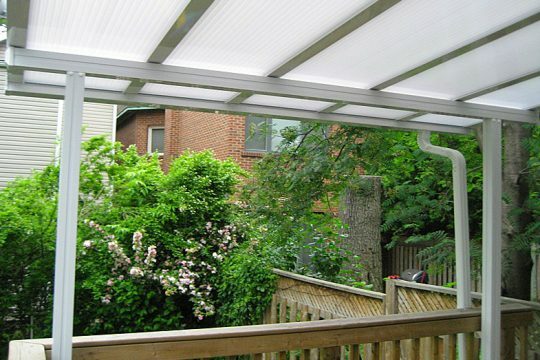 This amazing product filters out heat but lets in pleasing amounts of light. 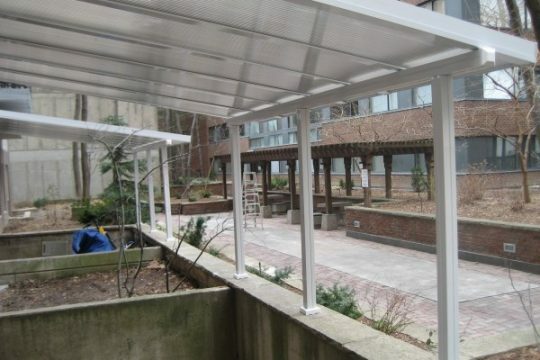 Our 16mm (⅝”) triple skinned impact resistant sheet is available in clear, bronze and opal ice. 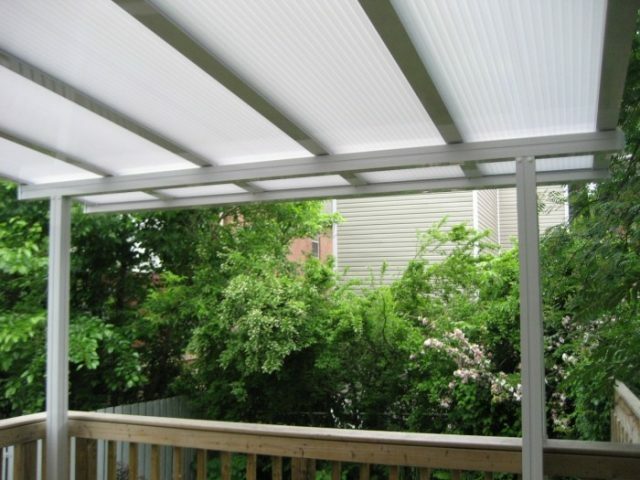 These sheets block harmful UV rays and resist weathering while transmitting diffused, natural sunlight. Continuous lengths up to 24′ means that there are no purlins (cross members). 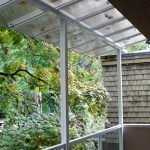 Solariums with glass usually limit the glass panels to approximately 4′ lengths for structural and breakage reasons, but that results in several purlins which are points where leakage can occur. 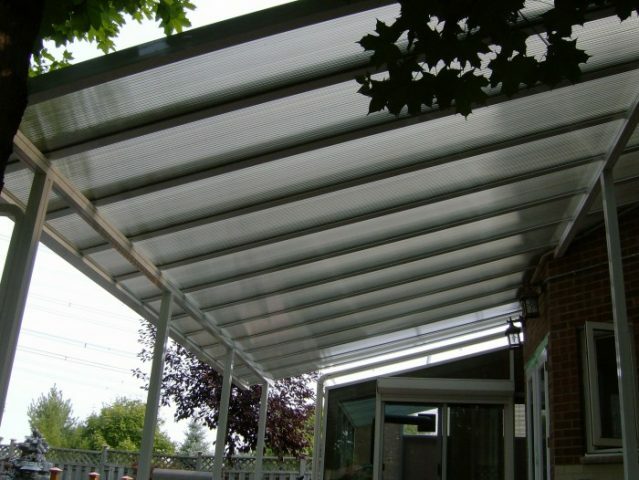 10 year polycarbonate warranty, non-prorated covering: discoloration, loss of light transmission and loss of strength due to hail damage (up to ¾” size hail). 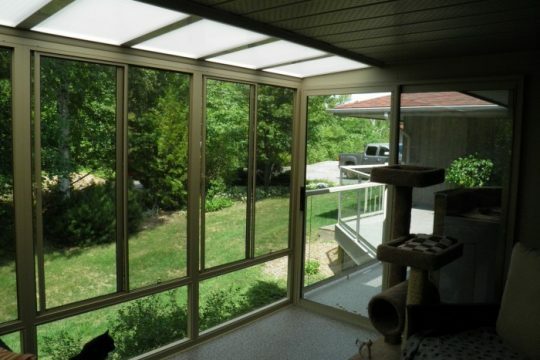 Practical alternative to glass – weighs less and the diffused light reduces heat build-up and glare. 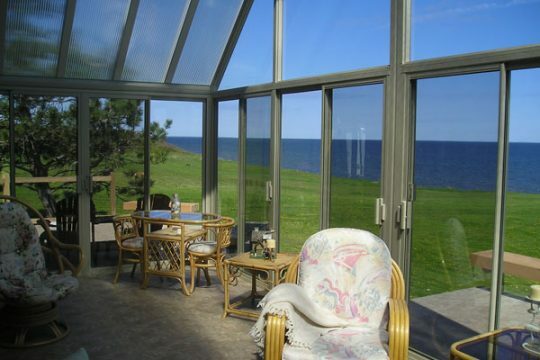 Solar heat gain coefficient (SHGC) is the ratio showing the amount of the sun’s heat that can pass through the glazing. 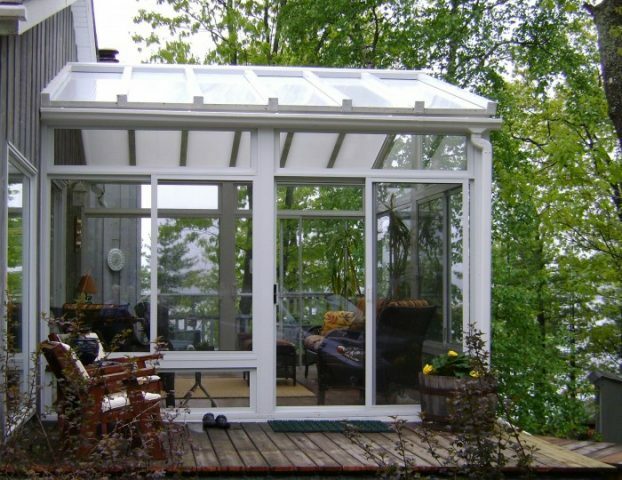 The lower the number, the less heat build up you will have in your sunroom. 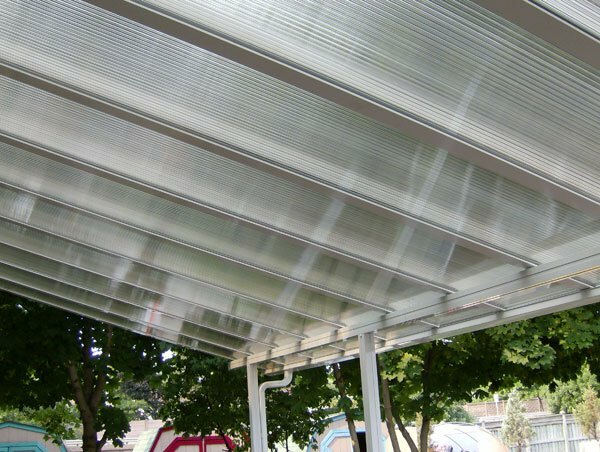 Multi-wall polycarbonate sheets are known by these manufacturer or trade names: Polygal, Palram, Sunlite®, Lexan®, Makrolon®, Merlon®, Makrolux®, and Marlon among others. 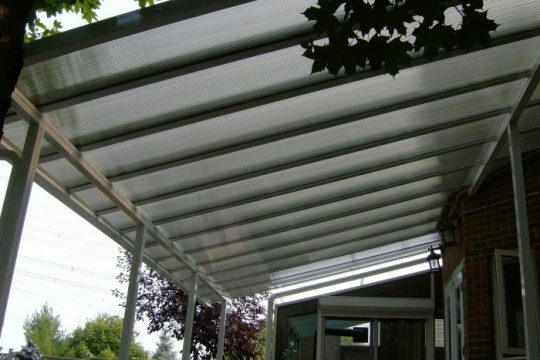 Polycarbonate sheets are used extensively around the world in greenhouses, roof glazing and daylighting applications. 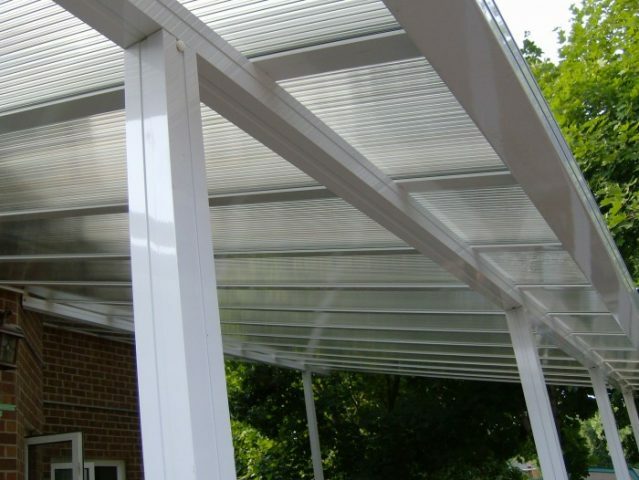 The importance of polycarbonate’s high strength and impact resistance can not be understated when considering snow capability, flexibility under load or falling items that can impact the sheet like hail, sliding snow and ice. 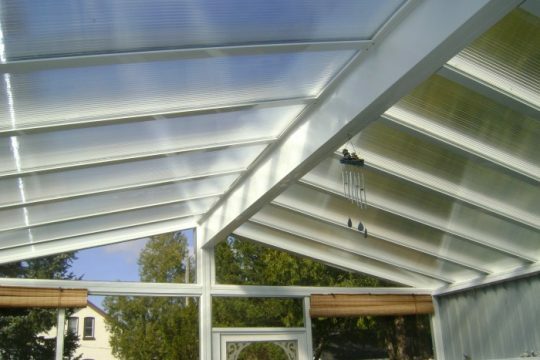 Polycarbonate is also used in high strength applications such as eye wear, bullet proof glass, headlamp lenses and industrial glazing. 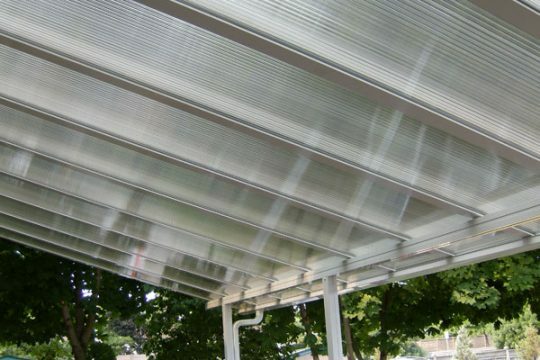 In all of these applications, Polycarbonate sheets use a protective layer to prevent UV damage and ensure a long lasting installation without any discolouration. 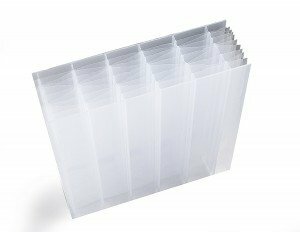 Multi-wall acrylic sheets are known by these manufacturer or trade names: Acrylite®, Cyro, Lucite®, Deglas®, and Plexiglas®, among others. 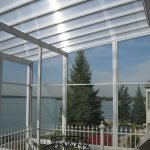 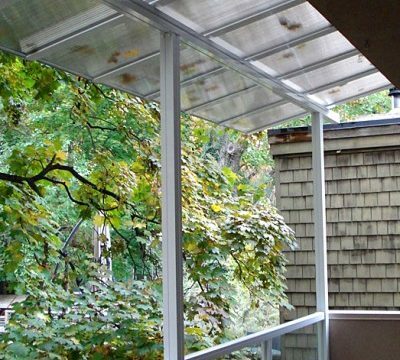 While known for its optical clarity, clear acrylic sheets (or polycarbonate for that matter) are not a good choice for sunrooms or other low slope applications like patio covers. 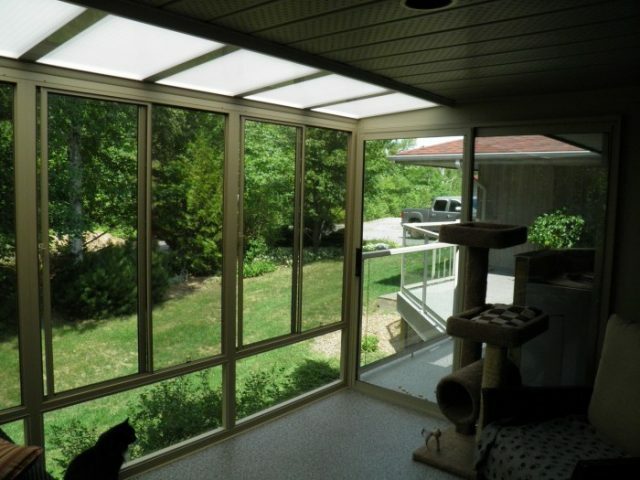 Clear sheets let in too much heat and glare. 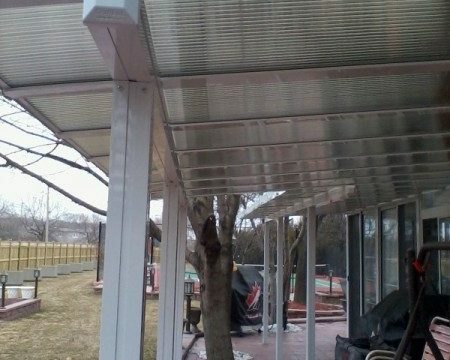 Debris on a low slope roof with any type of glazing is less likely to be washed away by rain and is more visible with clear sheets. Wise consumers will choose an opaque or otherwise tinted roof sheet with light and UV filtering characteristics and especially for sunrooms, a thicker multiwall sheet with excellent insulation properties. 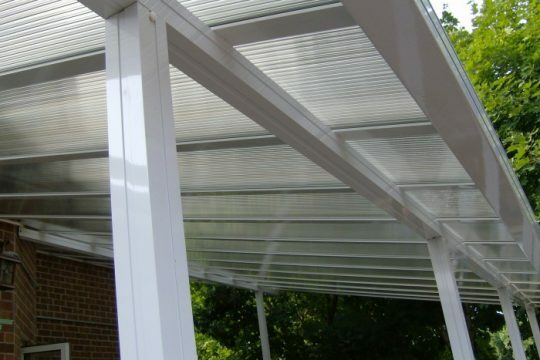 Both polycarbonate and acrylic manufacturers produce sheets with these characteristics. 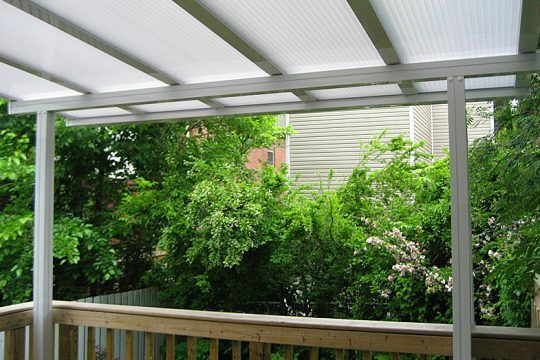 Acrylic sheets are more economical than polycarbonate, more brittle and more flammable. 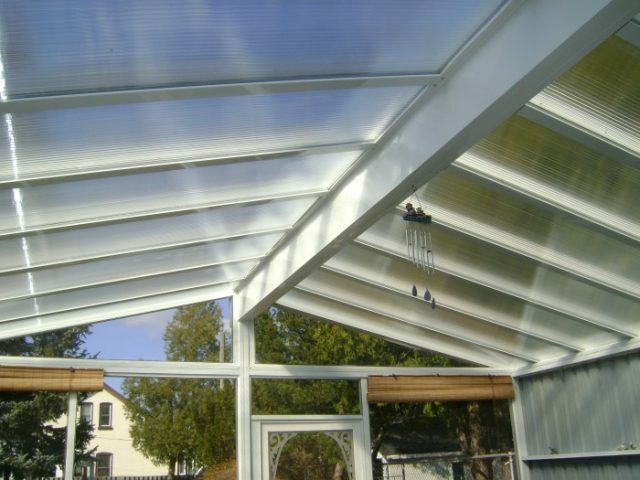 Skyview’s 4” high ‘I’ Beam Design. 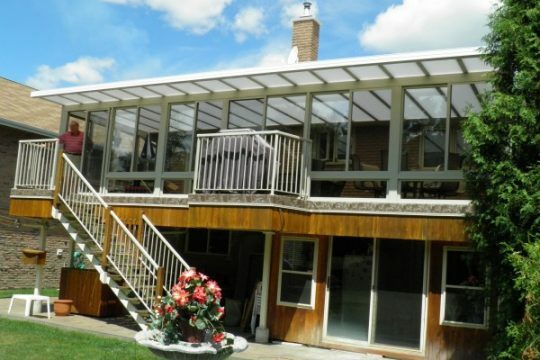 Never spaced more than 24” apart. 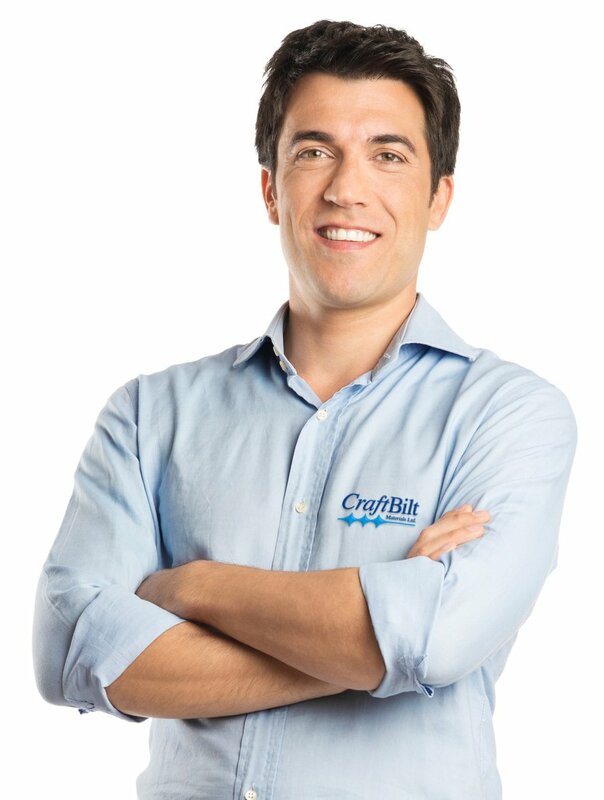 Fully tested. 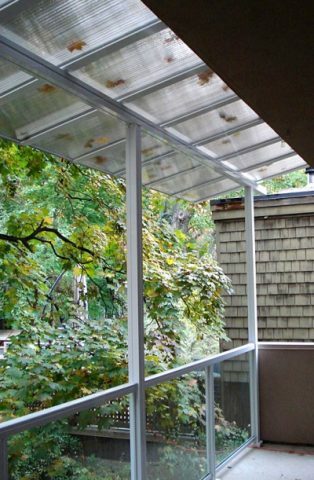 Snap Caps that hold down the glazing are not considered as a structural component. 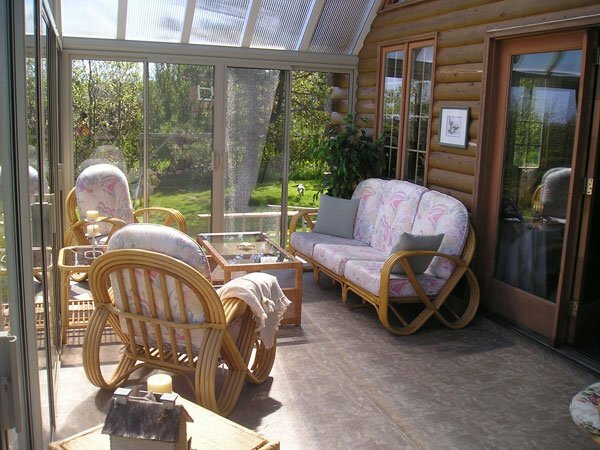 Thermal break to reduce the chance of frost or condensation. 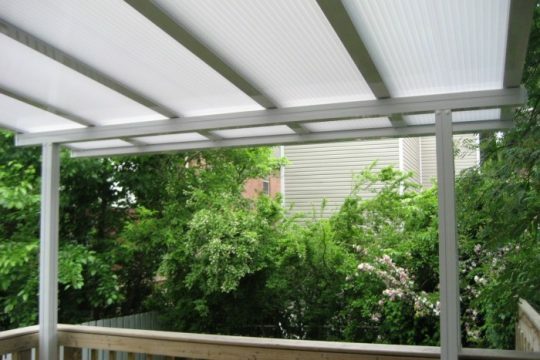 Especially import for enclosed sunrooms. 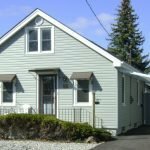 Will It Hold The Snow? 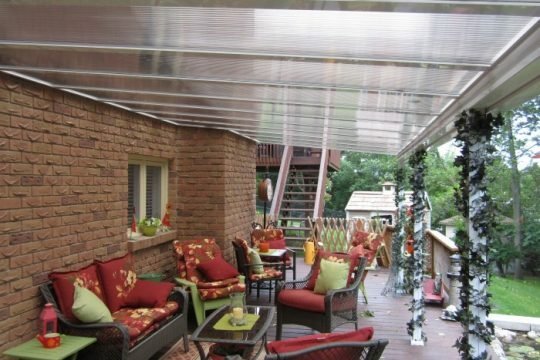 This manufacturer says that extra capacity is gained by putting screws through the snap cap. 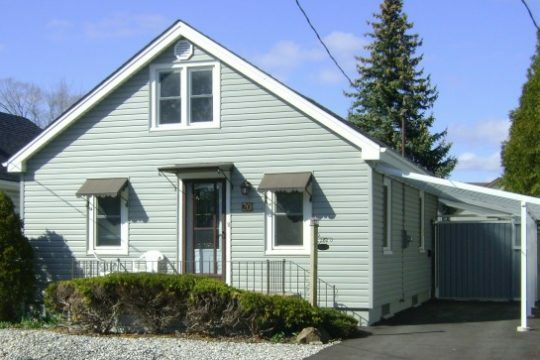 But it’s a shape that will spread out under pressure. 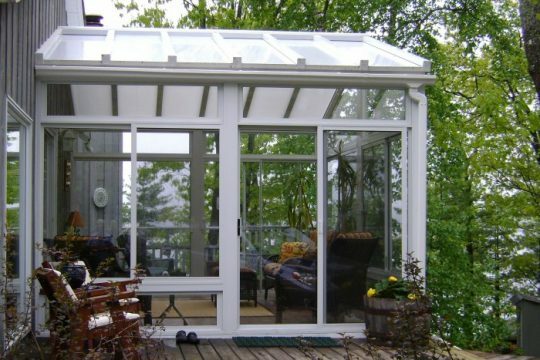 The cap can’t possibly stiffen the assembly in the presence of flexible ribbed rubber gaskets and a plastic glazing sheet. 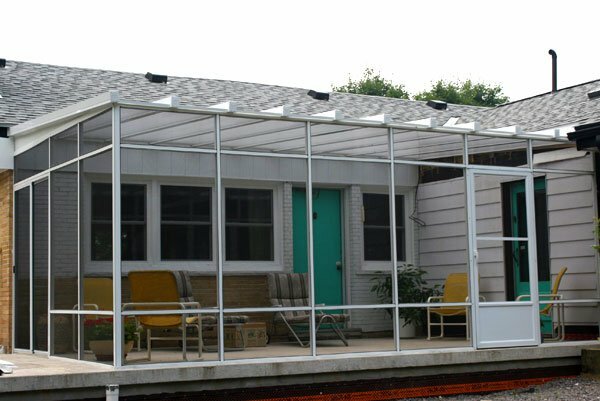 An upside down ‘T’ bar is not a structural shape. 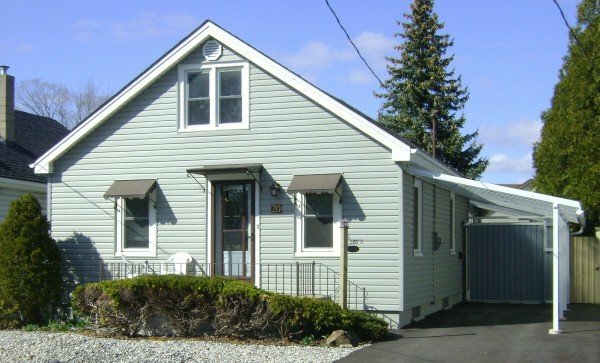 The shape pictured is only 3” high. 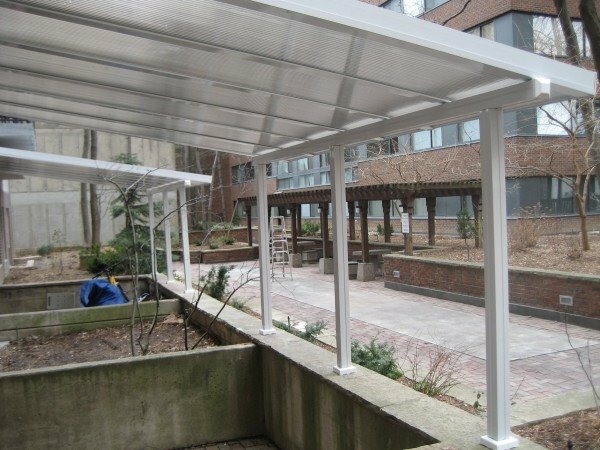 When designing the Skyview roof system, our designers ruled out the ‘T’ bar design as not having the capacity required to comply with building codes for common spans in most Canadian cities. 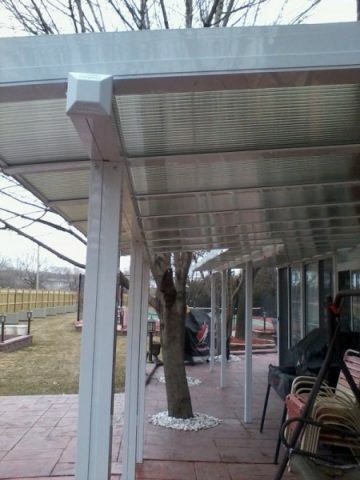 There is a thermal break cavity, but it is not used in this sample.